Do you need high speed internet for a convention or other temporary need in Indian Springs? 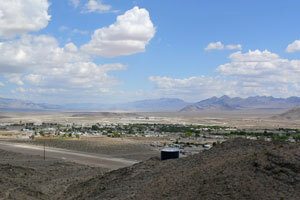 LV.Net is the number one choice for microwave internet in Southern Nevada. We will be in Indian Springs to deliver the best in high speed wireless microwave internet. LV.Net’s high speed microwave network is designed with unmatched flexibility and redundancy. The network core uses licensed carrier grade radios on all major backbone points. Towers with multiple transit links use OSPF protocol and mesh topology for fail over. Equipment used that allows for pro-active management and maintenance features reports and alerts for usage or port errors. Our network has a redundant power design, and is top tier. For over 16 years LV.Net has served the internet needs of individuals and businesses in Clark County. We are the tried and true solution for all of your internet needs. LV.Net is a full scale internet service provider. We are able to install fully secure point to point microwave business networks. Our Las Vegas facilities offer colocation hosting and cloud computing. There are a variety of options available with cloud computing. One goal with cloud computing can be to have an area where equipment and software—including applications—are located and run for the benefit of multiple users that access it using the internet from a different, remote location. It is sometimes possible to realize benefits from economies of scale from having equipment and software located and run in one place while accessing it with the internet remotely, than to have substantial equipment and software located and run in every place the equipment and software is being used. For example, if a person had 4 different places they would like to use equipment and software, it could make more sense to have 1 item of equipment and software located in one place and access it from 4 different locations using the internet, than to have 4 items of substantial equipment and software (one in each place). It might also be possible to reduce the amount of “front end” equipment and software at each of the 4 locations when accessing the “back end” equipment remotely. In some cases, there could be benefits with cloud computing such as reduced IT staff costs, increased reliability and protection from equipment malfunction, system downtime, loss of data, as well as unfortunate inconvenience and frustration, by choosing to minimize “front end” equipment and software and choosing to access and use “back end” equipment and software remotely as a service (rather than owning and maintaining the back end hardware and software). These are only some of the options involving cloud computing, and there are a number of different possibilities depending on a person’s individual needs. We are able to provide almost any internet service imaginable. Over the years, demand for internet has grown. Our staff has grown to meet this challenge, and they have also increased our capabilities in the process. Today, our microwave network spans throughout Nevada and beyond. Areas we serve include Primm Valley, Southern California, Mesquite, Las Vegas, Pahrump, and parts of Southern California and Arizona. Our microwave network continues to grow with every passing day. Our high speed wireless microwave network provides internet speeds of up to 1 Gbps. Technical support is available 24 hours a day, every day of the year. LV.Net’s technical staff are trained and experienced. They are ready and able to install a wireless microwave internet connection in Indian Springs to our microwave network. Installing LV.Net’s microwave internet is hassle free. Access to fiber optic cable is not required. Microwave internet can sometimes be installed in one day. If you need internet service for a convention or other event in Indian Springs, please give LV.Net a call today at 702.900.0000. We look forward to your phone call and discussing the options we can provide based on your individual needs. Have a convention or in need of temporary High Speed Internet 1Mbps to 1000Mbps in Indian Springs call us now 702.900.0000 for a quote or email us.